In January, the IRS released aggregate results of country-by-country reports (“CbCRs”) filed with the IRS for the 2016 tax year. The tax stats page here contains six files, five of which contain a different summarization of Table 1 data, including third-party and intercompany revenue, profit, cash and accrued income tax, earnings, employees, and tangible assets. The first of the files presents this data by jurisdiction; the second limits this data to only jurisdictions where taxpayers reported profit before tax for 2016; the third presents only those jurisdictions where taxpayers reported zero profits or losses before tax; the fourth presents the statistics at a major industry level; and the fifth aggregates the statistics by accrual-basis effective tax rate (“ETR”) groupings of the individual jurisdictions. 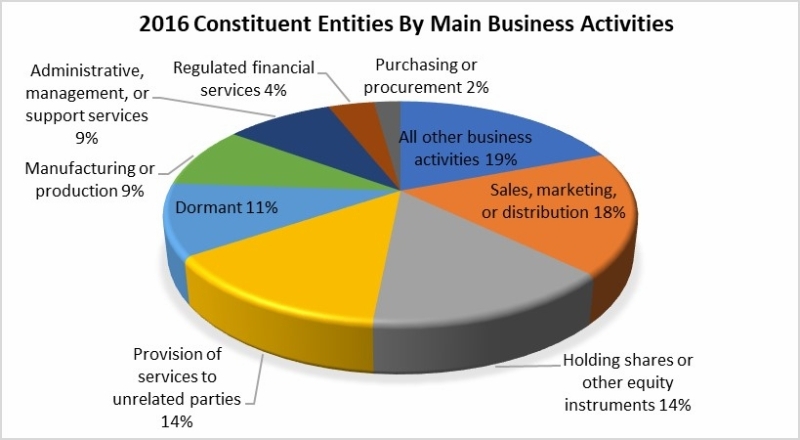 Conspicuously, four activity selections available to the taxpayer—“research and development,” “holding or managing intellectual property,” “internal group finance,” and “insurance”—are absent as separate categories and grouped into “all other business activities” in the aggregate statistics. It is important to note that it is not possible to identify individual taxpayers in any of these summaries, given their highly aggregated nature. 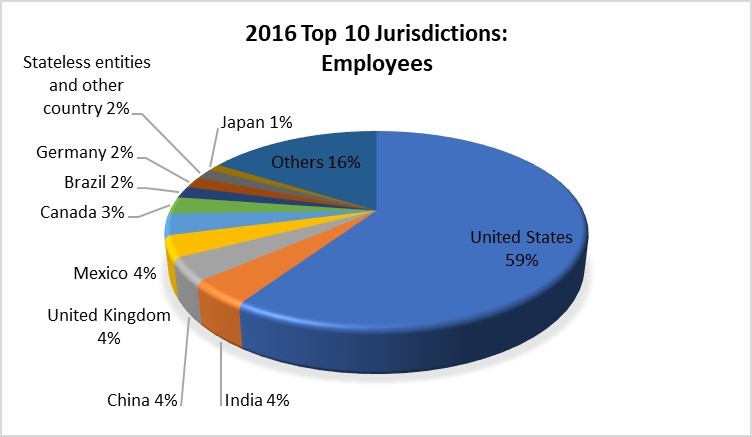 The chart below shows the top 10 jurisdictions by the number of employees reported in 2016. The United States accounted for 59% of total employees while no other jurisdictions accounted for more than 5%. 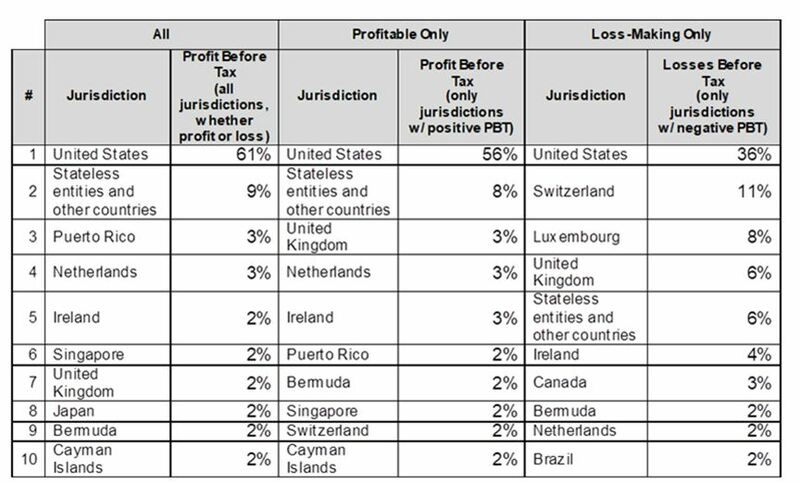 The table below summarizes the top 10 jurisdictions by profit (or loss) before tax. In 2016, among all reporting entities, the United States accounted for 61% of total global profit before tax (“PBT”) among U.S. CbCR filers, while no other jurisdiction accounted for more than 10% of total global PBT. Below, the “Profitable Only” and “Loss-Making Only” sets of columns disaggregate the data in the “All” column into jurisdictions in which individual filers reported profit and jurisdictions in which filers reported losses. The IRS may likely identify taxpayers with high profit before tax in low-tax jurisdictions for further audit, while foreign jurisdictions may likely identify taxpayers with losses before tax or low profits relative to other metrics as targets for further audits. The chart below is based on the IRS’s grouping of individual jurisdictions by ETR and shows related party revenue as a percentage of total revenue by ETR group. The groups with effective tax rates of less than 25% are also the groups with the highest share of revenue coming from related parties rather than third parties. Table 1: Where do the business activities of multinational enterprises (“MNEs”) take place? Table 2: What are the tax rates paid by MNEs? Table 3: What is the relationship between tax rates and the business activities of MNEs? Not all U.S. multinationals needed to file CbCRs for tax year 2016, so one should expect that when 2017 data are released at the end of 2019 or beginning of 2020, the number of taxpayers included in the statistics will increase. Watch this space. More data to come.